When you go snorkeling or even spearfishing, your main motive is to enjoy the experience and make the trip worthwhile and only good gear allows you to do so. Things like fins, masks and snorkels ease the process and let you focus on the thing that matters the most- exploring the underwater world. While the mask and snorkel act as providers of basic needs (like vision and air) the fins are what makes your job that much easier. 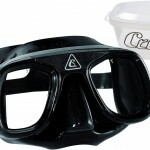 Thankfully with Cressi’s new scuba diving set, you get all three for the price of one, saving you a whole lot of money. Are these products worth their while then? Let’s take a look. 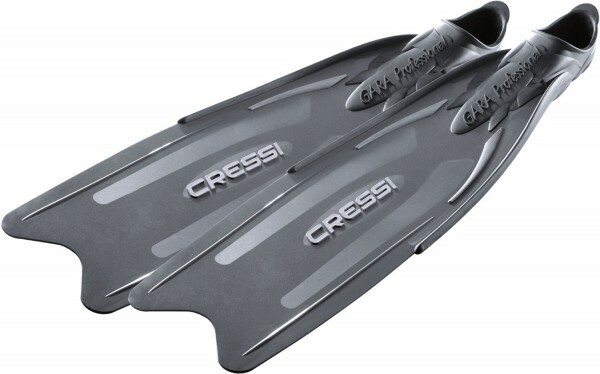 These fins by Cressi have been a constant component of many an experienced diver’s arsenal. It is coz of their high quality design and reliable durability that these fins have stood the test of times and are considered the favorite for many. A good pair of fins should allow you to virtually swim like a fish- that is by allowing you to go long distances swiftly without making too much of an effort. The longer the fins, the easier a diver would find it to swim and that is why the Cressi Gara Professional LD scuba diving fins are perfect not only for professionals but also for beginners who would like to take it easy at first. 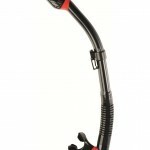 The fins are manufactured using a special blend of elastomer polypropylene that makes them not only more fluid but also provides them with extended durability. 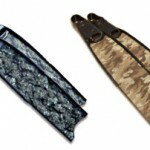 In the new design, the shoe pocket is placed right under the fin and fits snugly around your foot. You can try kicking at it hard but it won’t come off. Its main purpose however is to make swimming as effortless as possible by ensuring that the fin moves in unison with your foot, so much so that the fin will feel like an extension of your feet. The energy dispersion of every kick is very even and this is why you can swim very swiftly even when employing softer kicks and with much less fining effort. Since the blade of the fin is just at the right flexibility, the kicks are also as fluid as they can be. Therefore by using these blades you will not have to worry about swimming and can focus your mind on the task at hand, whether spearfishing, scuba diving or just freediving. If you are a hard swimmer then now worries wither as they can easily sustain hard kicks as a result of the snug feet and you won’t find them coming loose underwater at all. The foot pocket is made using flexible elastomer and provides for a very comfortable fit, meaning that you won’t have to worry about any chafing or rashes. In this pack you also get an additional mask and a snorkel, meaning that you won’t have to buy them separately. 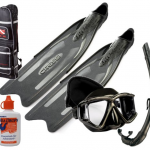 All in al, not only do you get a great pair of fins, you also get additional gear that you would need eventually thereby saving you a lot of money. A must have for any diver!